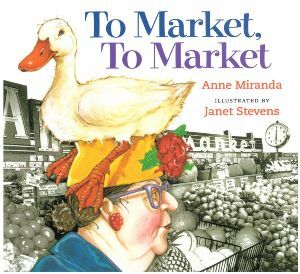 Anne Miranda’s brilliant spoof of Mother Goose’s not-so-vegetarian-friendly nursery rhyme “To Market, To Market” is full of humor and compassion, teaching kids that animals make better companions than they do food. Janet Stevens adds the illustration, overlaying retro photos in black-and-white with witty drawings. Kiddo and I love the expressions on the main character’s face as the animals she buys for food run amok in her house. In the end, the woman and these same animals — who have become her friends — return to the market to buy vegetables for lunch. The message of this book is as light-handed as it is clear: There are many wonderful things to eat without eating animals. This is one of my very favorite children’s books – I loved reading it to the kids at the preschool where I used to work, and they loved hearing it!